So I know it&apos;s fun to see if your colleagues on the Street can eat an obscene amount of oysters in one hour, or the contents of a vending machine in one day, but we can&apos;t help but feeling it could be equally if not more entertaining to watch a guy starve himself for a week, especially if you stood to make some money off of it. Starting Monday, Anthony G, the "Hungry Barbarian," will attempt to "survive" in the wilderness of his backyard in the Hamptons. According to the rules of the 7-day challenge, he cannot buy or be given food; he can only ingest what he catches, be it fish from a neighboring bay, or, if he gets really desperate, and here&apos;s hoping he does, the neighbor&apos;s cat, which has a habit of wandering off its lawn. RE: making money off of the absurdity, betting boxes will be in 1 hour durations, with the hours of midnight-6am counting as one box (i.e. 19 boxes per day for 7 days). $10 gets you one randomly selected box, $100 gets you 10 randomly selected boxes plus one box of your choosing. Email him at hungbar at gmail dot com. As of now, the pool is only up to $400. I&apos;m considering spending my annual take-home (X 2) on a box, but just out of a support. I don&apos;t really care what happens, I just want to see a guy in the Hamptons eat a squirrel. 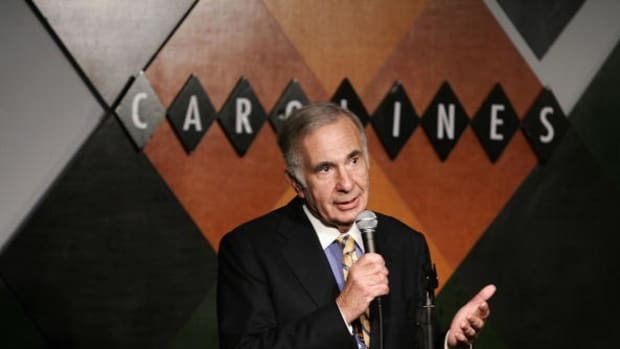 Carl Icahn Finds 307,000 More Ways To Tell Bill Ackman "I Will Haunt Your Dreams"
The Pershing Square manager will never be free of this guy. Viagra: Tastes Great, or Less Filling? Sorry that a good-looking, scantily-clad Asian woman appeared on your screen, you prude.